Our Camembert cheese recipe will guide you, step by step, to make a great textured and flavorful homemade cheese. 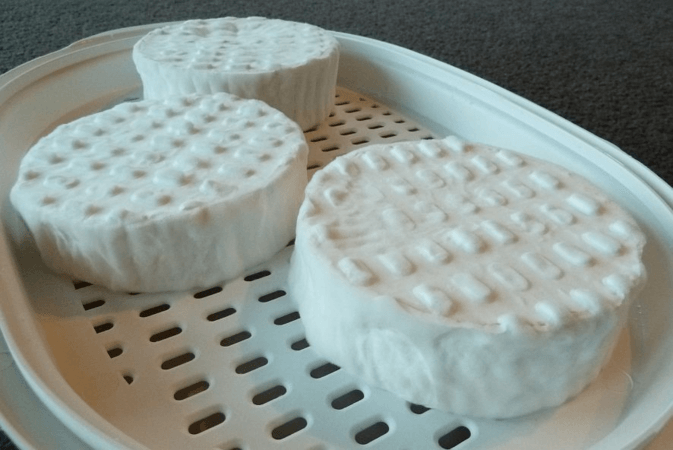 With this simple yet tried and proven recipe, you’ll have more confidence in your cheese making, experience fewer errors, and uncertainties throughout the process. I will bring to your attention how to store your homemade Camembert and introduce you to some wine pairings and recipes you should definitely try out with this flavorful cheese. It is a soft, creamy, surface-ripened cheese made from cow’s milk. Recognisable by it’s white mold rind, which is edible. It was first made in Normandy, northern France in the 18th century. It is delicious to spread on a thin cracker or eaten by itself rind and all. Marie Harel was a French farmer in the Brie region of Normandy. She first started making Camembert in the year 1791. The story goes that Marie sheltered a priest fleeing the French Revolution who in turn he gave her advice on cheese making. Adding to her own knowledge of cheese making, she came up with a cheese and packaged it in small round wooden boxes. Marie made her cheese using unpasteurized milk known as lait cru. However, only a small percentage of cheese producers today make their cheeses from raw cow’s milk using the process Marie Harel would have used herself. The production of cheese using the same methods as Marie Harel’s legally qualifies a cheese to be called Camembert Normandie. This is under established AOC guidelines. However, like many other types of cheese, the production of Camembert cheese transcends AOC designation in the sense that there are numerous variants. There are excellent varieties that are made using pasteurized cow’s milk in the Normandy region. By far the best known is the Camembert Le Châtelain. Warm the milk up to 32°C / 90°F. This can be achieved by placing on the stove and slowly heating the milk up whilst stirring. Or place the pot with the milk in the sink with warm water. Add both starters by sprinkling over the surface of the milk to avoid caking and clumping. Wait 1-2 min then proceed to stir the mixture thoroughly. Leave the mixture to ripen for 90 minutes. Add in the rennet and stir in up and down motions for about 30 strokes. Leave for about one hour or until a clean cut has been achieved. Cut the curd into 1cm cubes. Afterward, leave the curds to settle for an extra 15 minutes. Ladle the curds into sterilized molds. Leave the curds overnight, or for 8 hours then flip over the cheese. Leave the cheese for an additional 8 hours until the whey is sufficiently drained. Remove the cheese from the mold and sprinkle with salt on all surfaces. Age the cheese in covered containers where the cheese is raised to allow the whey to collect underneath but not to come into in contact with the cheese. Age your cheese at 95% humidity while ensuring you regularly wipe the contact to get rid of excess moisture. Ensure you don’t let moisture to contact the cheese. White mold should begin to develop in about 7 days. Regularly turn (once daily) and age for about 2 to 3 weeks while the mold is still developing. Once the mold has covered the entire cheese , it’s time for the final aging. Wrap the it up in a cheese wrap. Store for an additional 4-6 weeks. It is finally aged and ripened by moving the cheese to a cooler room that should be about 5.5 to 7°C / 42 to 45°F. At this temperature, your cheese should ripen to your preferred age over the course of the following weeks. You may even go ahead to first wrap the cheese in wax or parchment paper then cover it with plastic wrap before putting it in your refrigerator. To prolong the shelf life after cutting, wrap it in plastic wrap or parchment paper. It is however not recommended to freeze, as this may cause it to become crumbly and lose most of its flavor. Young Camembert cheese has a sweet, milky taste. As the cheese ages, it acquires a smooth, runny interior with a white bloomy rind. Delicious and ready to eat when the cheese becomes slightly runny after being brought to room temperature. It is delicious by itself, on a cracker, with some fruit, as part of a cheese platter or with any accompaniment you desire. To be honest it can be eaten with anything anytime. Gooey, melted Camembert recipes have got to be one of the best treats. These recipes are perfect for sharing with your friends and family and are the ideal starter for dipping. This is one of my favorite recipes. It is a family classic everyone looks forward to. If there ever was a holiday recipe that got me excited, it would be the Cheese Filled Brioche Christmas Tree. It is such a simple Christmas starter recipe, yet so satisfying! This recipe is sure to lighten up the mood in your home and put everyone in high spirits. Looking for an easy, last-minute crowd-pleaser? Well, you’re in luck. A great easy recipe for your dinner parties and is also good enough for your guests when entertaining anytime of the year. Preheat the oven to 180°C on fan forced. Remove the cheese from its packaging and place in the oven. The wine to pair with it would be a light red wine such as a Chenin Blanc, St. Estephe, Beaujolais, St Emilion, or something more traditional like a glass of Normandy cider. A 100g slice contains 300 calories, of which 71% are fats, 28% protein and about 1% carbs. The cheese also contains vitamins A and C, Calcium and Iron. No, it is not safe for consumption by pregnant women as it may contain listeria bacteria which can cause complications to the pregnancy. In case you ever need to substitute for some other type of cheese, you can use either of the following cheeses. These cheeses are similar in texture, and go down well with fresh fruit and crusty French bread. I hope you enjoy our Camembert cheese recipe as much as we do.